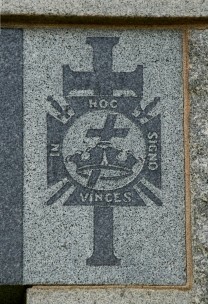 What you see on the tombstone of the founder of the Watchtower movement is the Knights Templar Symbol for the York Rite of Freemasonry (See below). This degree is equivalent to the 33rd Degree of Freemasonry and is the highest degree of the York Rite indicating that he knew whom he was serving. It was not Jesus Christ of Nazareth to be sure. 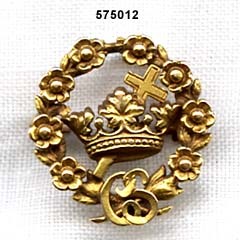 Shown below are examples of how the Christian Science and Jehovah's Witnesses cults have used this symbol. 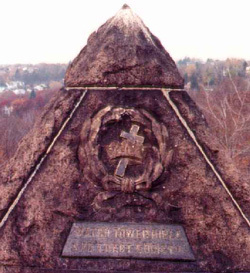 This is where Charles Taze Russell (1852-1916), 33rd Degree Freemason and founder of the Jehovah's Witnesses cult is buried. Masonic authority Albert Pike also wrote of the meaning of the above symbol in his book Morals and Dogma, explaining that it has a sexual connotation to it as well. 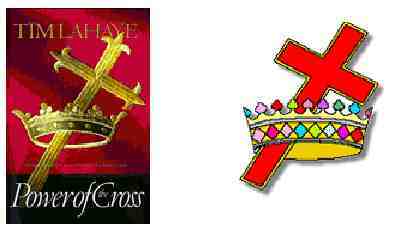 (Why is this symbol on a 'Christian' book cover). Was it also a coincidence that LaHaye and his associates set up their Pretrib Research Center in a place that's considered a vortex of occultic power in Washington D.C. They were located on L'Enfant Promenade, a street named after the Mason Pierre Charles L'Enfant who designed the city in Masonic and Occultic symbols. From there, coincidently, they moved their research center to the Dallas area, another city that is sacred to Freemasonry because of its proximity to the 33rd degree of latitude. Christians aren't supposed to believe in coincidences? Above: Oral Roberts Medical Center. Notice the Illuminati pyramid. 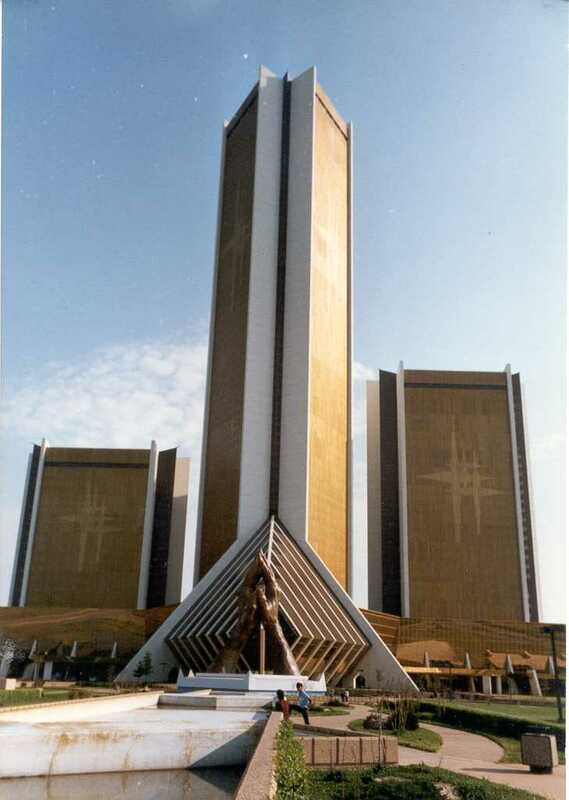 Oral Roberts was an occult 33rd degree Freemason. The Charismatic Movement teaches the lie of Lordship Salvation, a false Gospel. Jack Chick caters to them in his tracts by requiring people to be willing to stop living in sin to be saved. It is not what you're doing that gets you to Heaven, it's where you're looking. Look to Jesus! Photo to Right: Founder of 7th Day Adventism, Ellen G. White's Tomb Stone. Notice the Illuminati symbol. Obelisks represent Freemasonry, clearly evidenced by the Washington Monument. George Washington was a 33rd Degree Freemason. Without prophetess Ellen G. White (November 26, 1827 — July 16, 1915) there would be no Seventh-day Adventist [SDA] Church; however, SDAs seek to avoid the issue because Ellen G. White’s life was saturated with occultism, damnable heresies and bizarre experiences. SDAs revere White’s writings as being equally inspired with the Bible. Interestingly, Charles Taze Russell (founder of the Jehovah’s Witnesses), Ron Hubbard (founder of Scientology), and Joseph Smith (founder of the Mormon religion) were all 33rd Degree Freemasons. Satan is the god of this sinful world (2nd Corinthians 4:4) and operates through the occult to perform his works of darkness. 2nd Corinthians 11:13,14 informs us that Satan transforms himself into an angel of light to deceive people, and his sinister ministers are transformed into ministers of righteousness. Should it be surprising then that the Catholics, Mormons, Jehovah’s Witnesses, Scientologists, Christian Scientists, Seventh-day Adventists, and other religions are all OF THE DEVIL. There is a visible, obvious, verifiable occult connection between nearly all major religions today, especially with Freemasonry. Photo to right: Max Lucado's 2009 book, FEARLESS, clearly showing the Masonic pyramid. Just as Rick Warren, who is an Illuminati plant and CFR member, so is Max Lucado a part of the New World Order's Ecumenical Movement. Notice the Masonic pyramid and the top capstone too! We see this much today! Ecumenicals are dangerous false prophets who profess to believe the fundamentals of the Bible in their statement of faith; but for filthy lucre's sake teach and promote something entirely different. Ecumenicals are very vague in their teachings, to avoid offending supporters or fans. Ecumenicals will say different things to different crowds, whatever it takes to make more money. God is not the author of confusion; Satan is! 1st Corinthians 14:33, “For God is not the author of confusion, but of peace, as in all churches of the saints.” You'll hear Benny Hinn say wonderful things in one sermon, perhaps even falsely thinking he is a Christian at times; yet in other places you'll hear him endorsing Our Lady of Fatima (Catholic) on the Larry King Show, teaching doctrines of devils and partaking of demonic false healing and heretical tongues meetings. NBC Nightline has documented that Hinn is a big fraud and liar. Benny Hinn wants your money, and he has learned that people will give him their money if he makes them feel good. So Hinn, like other televangelists, preys upon people (2nd Peter 2:3). 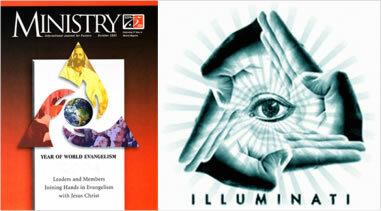 Ecumenical ministries and Contemporary Christian Music (CCM) singers use occult symbols. Ecumenical preachers are part of the New World Order (whether they realize it or not). And again, ecumenism is defined as: trying to unite religious people by error; rather than dividing over truth as God commands (2nd Corinthians 6:14-17). 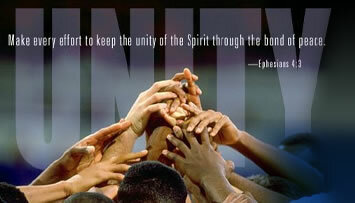 Love and unity are sinful compromise if not based upon THE TRUTH (John 4:24). Ecumenical preachers deceitfully claim to believe the fundamentals of the Bible (Ninety-nine percent of everything they teach, publish, and do in public is apostate mumbo-jumbo, self-helps, how to become a success financially; virtually devoid of the fundamentals of the Bible, i.e., the Doctrine of Christ mentioned in 2nd John 1:9. Their statement of faith is a mere smokescreen to deceive their Bible-believing critics. Ecumenicalist are opportunists who will change like a chameleon lizard to whatever color necessary to make money and deceive their prey). Ecumenicals almost always end up on the New York Times Best Seller List of books. The Illuminati, i.e., the movers and shakers behind the evil New World Order, promote Ecumenicals because it helps achieve their goal; which is a one-world order, one-world religion, one-world economy, one-world government, one-world court, one-world everything!!! The Antichrist will be a dictator, who will bring order out of chaos to the world. Ecumenicals want to unite all denominations in error; speaking the truth in one breath, while uniting with liars in the next. As mentioned, they post a statement of faith to look like genuine Christians; but all of their books and public teachings are completely devoid of THE TRUTH that matters. The Doctrine of Christ is ignored. Hell fire and damnation are not mentioned. The King James Bible is abandoned. Whatever true Biblical doctrine exists in ecumenism is buried behind worldly music, secular philosophies and unbiblical unity with apostates. Satan knows if he can corrupt just a tiny bit, just get an inch in the door; he's home free! It only requires the tiniest amount of virus to infect the entire body. This is why it is very important that we as believers contend for the Biblical faith (Jude 1:3), earnestly fighting against those who pervert the simplicity that is in Christ (2nd Corinthians 11:3), identifying them who cause doctrinal riffs in the church (Romans 16:17), rebuking with authority those who teach heresies (Titus 1:13), and refuting (exposing) all works of darkness (Ephesians 5:11). The Christian who is awake to righteousness and loves Jesus Christ has their hands full fighting the good fight of faith as a soldier (2nd Timothy 2:3). INTERNATIONAL CHURCHES OF CHRIST (ICOC) are a New World Order (NWO) religion. On their main website, it is no coincidence that the following joining of hands coincidentally forms an Illuminati pyramid (as seen everywhere in the corporate and religious world today). 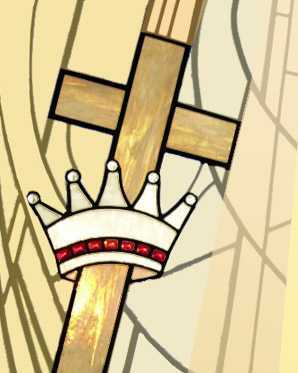 The symbol shows allegiance to the New World Order, whose god is Satan, whose anticipated leader will be the Antichrist. Oh, how I wish that I could wake people up to the truth of what's going on in the world today. Look at the image above. Who joins hands like that? You can see that they're a part of Satan's NWO!!! The Freemasons who head all of today's mainstream religious denominations are leading the gullible world's masses into World Religion. When the Antichrist comes, that is, the Beast, he will seek for all men to worship him, including the churches and different denominational groups. The stage is now being set. False prophets like Max Lucado and Rick Warren are setting the stage for the Antichrist. As hard as it is to imagine, it's true. Lucado was named “America's Pastor” by apostate Christianity Today magazine and in 2005 was named by demonic Reader's Digest as “The Best Preacher in America.” He has been featured on The Fox News Channel, NBC Nightly News, Larry King Live, USA Today, and a bunch of other worldly demonic shows. Luke 6:26, “Woe unto you, when all men shall speak well of you! for so did their fathers to the false prophets.” There you have it! The Bible says it all! Jesus said that nearly everyone speaks well of false prophets! In 2005, ChristianityToday voted Max Lucado as the This is one more reason why I believe the Antichrist will come soon, which means that the Rapture of the saints is very near. Did you ever stop to realize that every unsaved hellbound Catholic, Mormon, Church of Christ, Seventh-Day Adventist, Jehovah's Witness and Christian Science cult follower believes in the death, burial and resurrection of Jesus Christ? It's true! So what sets the true Gospel apart from what all these demonic cults teach and believe? I'll tell you. The Bible speaks of the “simplicity that is in Christ” in 2nd Corinthians 11:3. The simple Gospel is that we are SINNERS and Jesus is the SAVIOR! Christ died, that's history; Christ died for me, that's salvation! The Biblical Gospel excludes all forms of self-righteousness; including water baptism, Holy Communion, Sabbath keeping, good works, church membership, speaking in tongues, amending one's ways, forsaking the world, et cetera. Eternal life is a free gift, paid for by Jesus' precious literal blood (1st Peter 1:18,19). Salvation is not something we do to get; it is a gift that we receive to have! We simply receive Jesus Christ as John 1:12 teaches, believing on the Son of God. The Gospel is so delicate, so profoundly simple, that it is easily corrupted. By adding even the slightest alteration, the Gospel is corrupted into a lie of Satan. The serpent came to Eve in the Garden of Eden to deceive her, saying, “Hath God said?” (Genesis 3:1). Satan called God a liar, tricking Eve. Similarly, there are many false religions and false prophets today who will tell you anything to get your money. 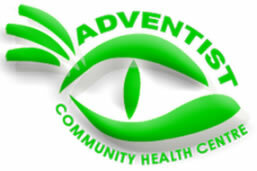 Seventh-Day Adventists are deceivers, led by Satan. I visited a so-called “Christian Bookstore.” When I was leaving, the woman behind the checkout desk gave me some of their business cards. I took a look at one of their business cards while driving away and almost drove off the road. Here is their card, which I scanned to my computer to show you. . . I immediately recognized the all-seeing eye, which is a very popular occult symbol, showing one's allegiance to the New World Order. It seemed strange to me that a small advertised Christian bookstore would be a part of the New World Order, so I went back to the store to take a closer look. I figured that they must be a part of a bigger organization that is a part of the New World Order. Sure enough, I found it. The owners of th store are apostate Southern Baptists. They are apostates, willing to sell anything to make a buck. They sell garbage by Max Lucado, a Church of Christ minister who teaches the fallacy of Baptismal Regeneration. Lucado teaches the Lutheran backdoor approach to this heresy, claiming that those who are truly saved will be water baptized, and if not, it shows that they've never really been saved. So effectively, Max Lucado does require water baptism for salvation. I also found some works of darkness by Doug Bachelor, who is a popular Seventh-Day Adventist speaker in California. I went home and looked up the GENERAL CONFERENCE OF SEVENTH DAY ADVENTISTS website, and here is their official SDA logo . . . 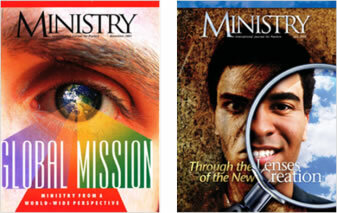 Above: Seventh-Day Adventist occult literature. SDA's are part of the Illuminati. Notice the All-Seeing Eye, which pictures the coming man of sin, the Antichrist. Look at all these occult images. Notice the shape of the Masonic occult pyramid, which is also displayed on the back of every U.S. one-dollar bill to mock the stupidity of society, and to remind us that we are now slaves to the Masonic-controlled New World Order . . .
Notice the all-seeing occult Eye of Horus, commonly displayed inside the Illuminati pyramid, which has its origins in ancient Egyptian occult religion. The all-seeing eye is representative of Lucifer, the angel of light, who is the god of this world according to 1st Corinthians 4:4. Here is the creepy logo for CBS studios . . .
Now take another look at the Seventh-Day Adventist bookstore's business card . . . They have the all-seeing eye and the Masonic pyramid displayed together, which is common. Usually the eye is inside the pyramid, and it is interesting to see the pyramid inside the eye instead; but they are occult symbols nonetheless, which often appear together, showing allegiance and support for the Devil. It is all creepy; but moreover, shows that Satan is in control of ALL organized religions. As born-again Christians, Jesus taught that the Kingdom of God is within us (Luke 17:21). Be warned my friend, Satan is behind all organized religions today, leading the masses to worship the coming Antichrist, the Beast. That's what the occult all-seeing eye and pyramid all represent, i.e., the completion of the New World Order, which will be led by the Beast. Thank God for those few faithful New Testament churches still remaining today, who have not bowed their knee to Baal, who do not display Masonic occult symbols on their building and literature; and have a man of God as their pastor watching over their souls, contending for the doctrine of Christ, teaching personal soul-winning, and taking a Biblical stand against public wickedness. The New World Order is here, which is what all the occult symbols reveal, whether it be in the secular realm or the clergy. Devotion to the Devil is everywhere, which is what I am showing you and warning you about. If you are a member or attend one of the mainstream religions I have exposed, please leave immediately and don't look back!